Having invested in a strong research organisation, the company was able to adapt to changing conditions. The site in Berkhamsted which was once occupied by much of the dip production was being re-developed to accommodate a new project, aerosol filling. 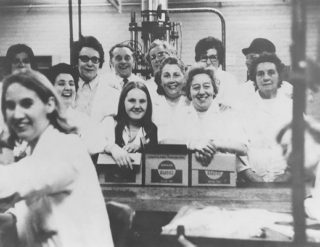 Another company, Walter Gregory & Co of Wellington, had already set up a single production line, and had exhibited an aerosol dispensing an insecticide at the British Industry at Birmingham in May 1950. 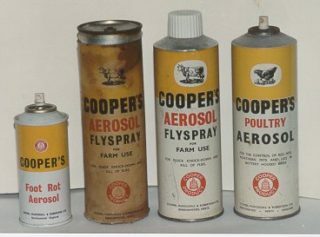 This happened to coincide with C.M.R’s commercial launching of their Fly Killer aerosol (the first product to be filled on the line originally known as “Cooper’s Household Aerosol”) which proved to be highly successful, with 20,000 aerosols produced in 1952, increasing to 40,000 the following year. PAFCO (Pressure Aerosols Filling Company) which was set up at Berkhamsted which undertook the filling of aerosols for outside companies. The first product filled for an outside customer was Palmolive “Rapid Shave” which within a short space of time was able to undertake filling aerosols with the branded products of many other companies, besides its own, and became a leader in aerosol production in the U.K for several years. In 1959, C.M&R was acquired by Burroughs Wellcome, a pharmaceutical company and experts in biologicals . 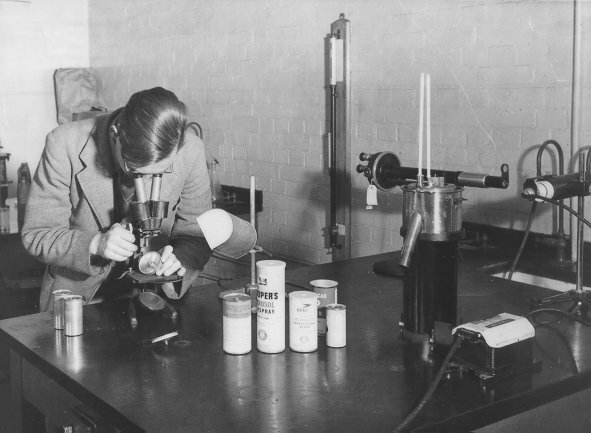 In 1965, the 100 millionth PAFCO aerosol was filled at Berkhamsted. In 1962, the manufacture of pipeonyl butoxide was transferred to Kelvindale, Scotland and by the early 1970s only one (pressure packs) out of the five aerosol lines was still operating. The Printing Office (now the Clunbury Cottrell Press) closed in 1979. Cooper’s Animal Health research station at Berkhamsted Hill, a joint venture between Wellcome and ICI was sold out to an American animal health company in the late 1980s. In 1992 the Wellcome Foundation sold its environmental health business including the Berkhamsted site to the French company, Roussel Uclaf. The chemical company, Hoechst (Rousell’s major shareholder) joined forces with Schering to form AgrEvo UK since 1995. The site finally closed on 31 July 1997.